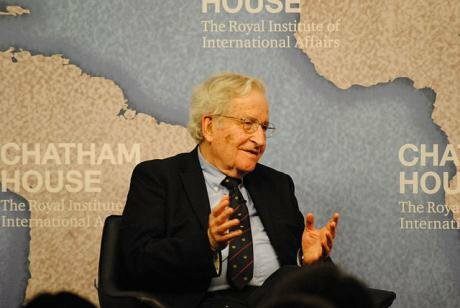 Noam Chomsky speaking at Chatham House, London, May, 2014. Wikicommons. Some rights reserved. I am a huge admirer of Decoding Chomsky, and appreciate the ongoing forum that openDemocracy has been running about it. Both Knight and the openDemocracy editors have asked me to contribute to the forum, and I’ve been disappointed that time and obligations have made that more difficult than I’d hoped. Partly that is due to the richness of the ongoing discussion, in which several of the contributions – especially the piece by Randy Allen Harris, with much of which I find myself in strong agreement – echo a lot of what I’d planned to say. As Knight and some others here have generously pointed out, my own interpretation of Chomsky’s academic career relies less on the question of how his research has been funded, than on questions about why his work should have been taken up so eagerly and rapidly among so many parts of the academy and beyond, especially given that many of Chomsky’s intuitions ran so directly counter to those of the prominent researchers in those fields (especially in Linguistics). Chomsky’s “revolution” was profound in a way very few have grasped, even today; one of the odder aspects of it is that Chomsky even now continues to be most influential in fields like Cognitive Science that take as established truths some of Chomsky’s positions that he himself abandoned, at least in broad outline, as early as the late 1970s. To me this demonstrates that it was those intuitions, or commitments – often lacking much empirical grounding – that help to explain why Chomsky became so wildly influential. A lot of people, inside and outside the academy, were looking for someone to say that the human mind is wildly different from other minds, that it does not use capacities animals do, that “rationality” itself is somehow hard-coded into it, and that the mind is essentially a “machine” or a “computer,” however metaphorical those concepts may be. This intuition bridges any number of intellectual, political, and conceptual divides, including ones like individual vs social, rationalist vs empiricist, reductionist vs holist, on and up to a certain, albeit nonspecific, political orientation. For much of western history, especially in the twentieth century, most of the political theorists who insist strongly on the individual as the primary locus of rights have tended to recommend conservative political theories; most of those who focus on social groups tend to fall on the left. It is no accident that many of the most vitriolic right-wing thinkers today take individualism and rationalism, and even the view that the mind must be a computer, as home truths. It is no accident that some of these figures – perhaps most famously, Sam Harris by way of Stephen Pinker – take a somewhat bastardized version of Chomsky’s linguistics (though ironically, largely the 1960s/1970s programs that Chomsky no longer recommends) as the foundational thought from which they build their worldviews. The major issue for me in understanding Chomsky’s institutional politics, as I see it, is not so much that he accepted military funding. It is how and why Chomsky took a discipline that had been profoundly committed to the social and political contexts and consequences of its subject, human language, and flipped it on its head, so that nearly everything relating to those aspects of language could be jettisoned, and only the individual was of much interest. Further, why a community of thinkers, largely not ones who had subscribed to existing paradigms (quite a few of them not linguists at all), chose to rally around this new and decontextualized approach. Knight’s view is that Chomsky walled linguistics off from utility, to say nothing of the social world, in order to also wall it off from the military. What this leaves unexplained is why Chomsky did not then turn to exactly the approaches that his “revolution” had undone: the fundamental commitment to language as a communicative phenomenon, the study of language as a part of communication (which does not exclude its study as cognition, demonstrated by the fact that Cognitive Linguistics – a very different field from Cognitive Science – has itself developed in large part as an alternative to Chomskyan approaches). Chomsky has never written much about this kind of work – the kind of work partly relied upon by the preceding guiding force in linguistics, Leonard Bloomfield, and which is better known through the work of anthropological linguistics prior to Bloomfield like Franz Boas and Edward Sapir, and through the kinds of sociolinguistics familiar from Dell Hymes and William Labov. Chomsky is largely responsible for Bloomfield being today primarily remembered as a behaviorist, whose work can be rejected on that basis (even though Chomsky’s famous critique of behaviorism was directed at non-linguist BF Skinner, it was Bloomfield whose stature suffered most from the critique, despite the fact that especially when applied to linguistics, the critique really seems to have seriously misrepresented its targets). To non-Chomskyan linguists, Bloomfield is known rather for the anthropological and empirical basis of his work: that is, his commitment to linguistic description and documentation, and to theorizing based on bodies of collected data. Bloomfield famously worked on Sanskrit, Tagalog, and four Algonquian (Native American) languages: Fox, Cree, Menominee and Ojibwe. This kind of intensive field work, which of necessity involves contact with real human speakers other than the researcher, is the most obvious difference between Chomsky’s linguistics in practice and those that came before. For a decade or more, Chomskyan linguistics tended to reflect almost exclusively on “grammaticality judgments” made by the researcher; that is still largely true today, although through the work of many other linguists such as Kenneth Hale and Mark Baker, the Chomskyan paradigm has expanded to world languages, but at the cost of the very explanatory generality Chomsky once reached for. To Bloomfield, this contact with language as it is used was a large part of what made linguistics in part a scientific discipline. Indeed, until Chomsky, it was a tacit or even explicit standard that a leading linguist would have close contact with, and then produce a grammar or other description of, a language other than the linguist’s own. Further, and this is something I talk about at some length in my 2009 book The Cultural Logic of Computation, it is very much the case that at the very moment the Chomskyan Revolution was happening, there was a great deal of clandestine pressure on the US academy to turn away from such anthropological and social approaches, precisely because they were seen as leading toward communism. The best work on this has been done on philosophy (in particular in John McCumber’s eye-opening 2001 book Time in the Ditch: American Philosophy and the McCarthy Era, work which McCumber has recently extended in his 2016 The Philosophy Scare: The Politics of Reason in the Early Cold War) but it manifests even there in Anglo-American philosophy’s engagement with Chomsky’s work. In the specter of the cold war, work that appeared in any way “socialist” was pushed aside in the academy. Most of those doing anthropological or socially-focused linguistics prior to Chomsky had politics that tended in that direction. So did Chomsky, but the fact that his linguistics research tended to push such concerns aside, and that those who adopted the Chomskyan paradigm virtually never drew connections between language and politics writ large, are the cultural phenomena that strike me as central. Prior to Chomsky, linguistics had been one of the most directly socially-engaged academic fields in the US, and its leading lights were found at universities that generally had many scholars with strong, direct social commitments. After Chomsky, linguistics in the US was headquartered at MIT, became highly technical and even algorithmic, and those whose social and academic commitments were front and center felt, in general, shoved aside. After Chomsky, linguistics in the US was headquartered at MIT, became highly technical and even algorithmic, and those whose social and academic commitments were front and center felt, in general, shoved aside.